Joseph Tumulty tells Herbert Hoover that Woodrow Wilson has signed the new Executive Order regarding wheat prices. 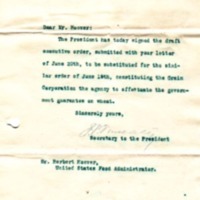 The President has today signed the draft executive order, submitted with your letter of June 20th, to be substituted for the similar order of June 15th, constituting the Grain Corporation the agency to effectuate the government guarantee on wheat. Tumulty, Joseph P. (Joseph Patrick), 1879-1954, “Joseph P. Tumulty to Herbert Hoover,” 1918 June 21, WWP19448, Hoover Institute at Stanford University Collection, Woodrow Wilson Presidential Library & Museum, Staunton, Virginia.